26 July 2018 by Q.
А major new feature of ICMIZER 2.14 is the display of bubble factors. Whenever you perform a Nash calculation you will now see differently colored circles next to each opponent which will indicate their bubble factor against you. The bigger the bubble factor, the more pressure you are putting on this opponent meaning that they will need more equity to call your pushes (as the most obvious example of applying bubble factor). As you can see, BTN has the smallest bubble factor and can actually call with the widest range (9.4%) versus our wide push. SB who has a larger stack has a larger bubble factor and can only call with a 3.5% range and BB who has the biggest stack and has a huge bubble factor of 2.7 versus us can only call with top 2.7% hands against our almost any-two push. The Bubble Factor concept is not very intuitive and can be hard to grasp for beginner players. So let's start slow and build it up from the simpler bricks. 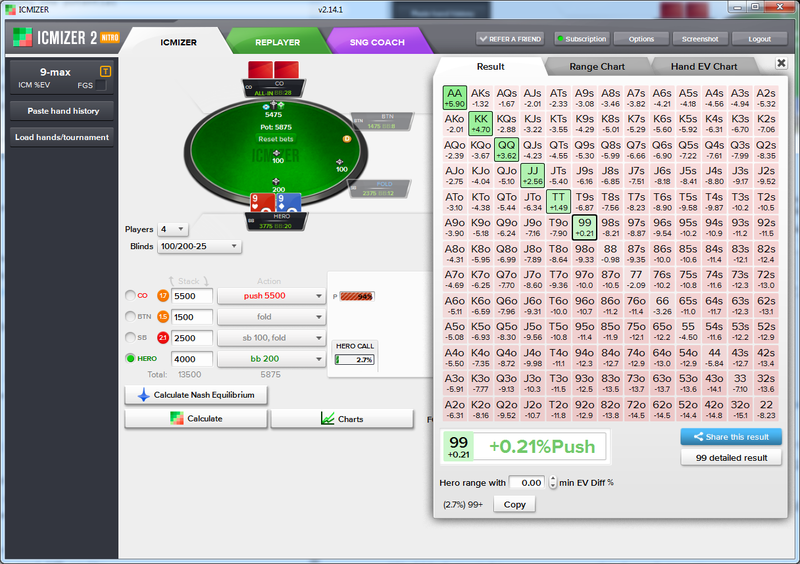 Let's say we are in Chip EV mode, either playing cash or tournament with 1 prize, like Spin & Go. 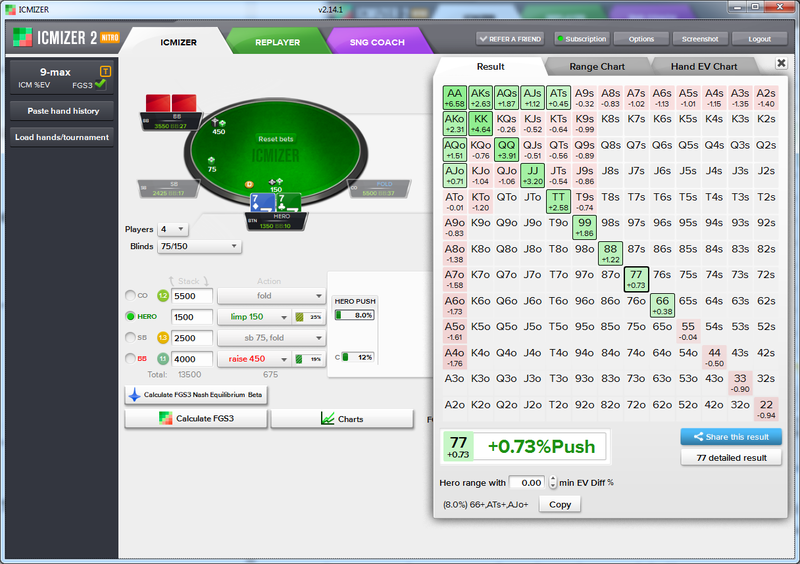 In this case, the absolute change in our stack worth of doubling up or busting from the tournament is the same. So if we double up from 500 chips to 1000 or bust, technically both outcomes change our stack worth by exactly 500 chips. Since both outcomes have the same absolute value (but a different sign, +500 or -500), winning 50% of the time would be enough to make us indifferent and justify the potential all-in. So in this case in order to calculate the bubble factor we would take the absolute change of our stack if we lose (500) and divide it by absolute change if we win (500) and we get 500/500 = 1. 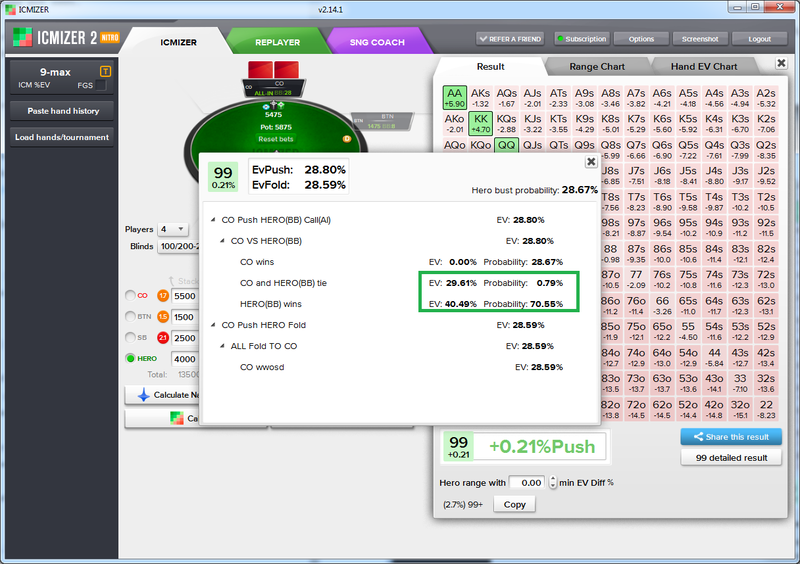 So in Chip EV mode or in tournaments with 1 prize the bubble factor is usually 1, you can play according to classic cash game pot odds. 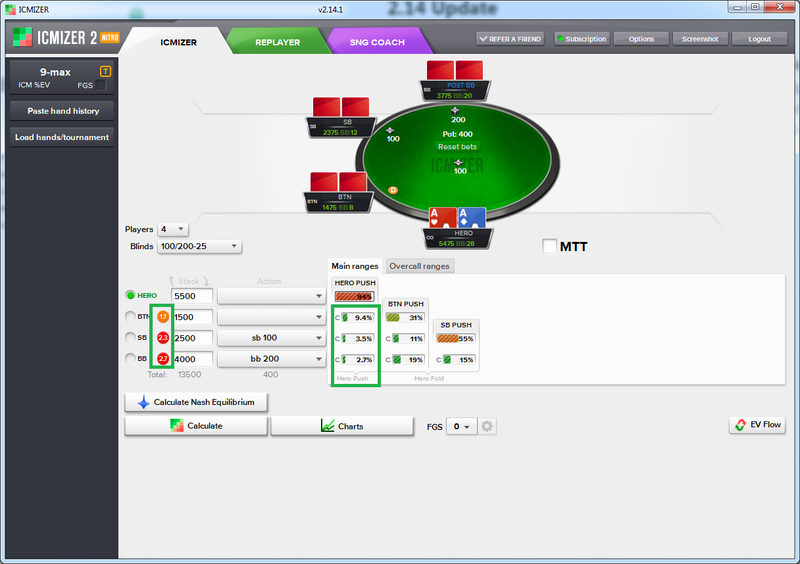 Now in SNG or MTT tournaments where we have more than 1 payout we have to use ICM to convert chips into their tournament prize equity value in order to compare decisions. Bubble Factor = ChangeInOurTourneyEquityIfWeLose / ChangeInOurTourneyEquityIfWeWin. 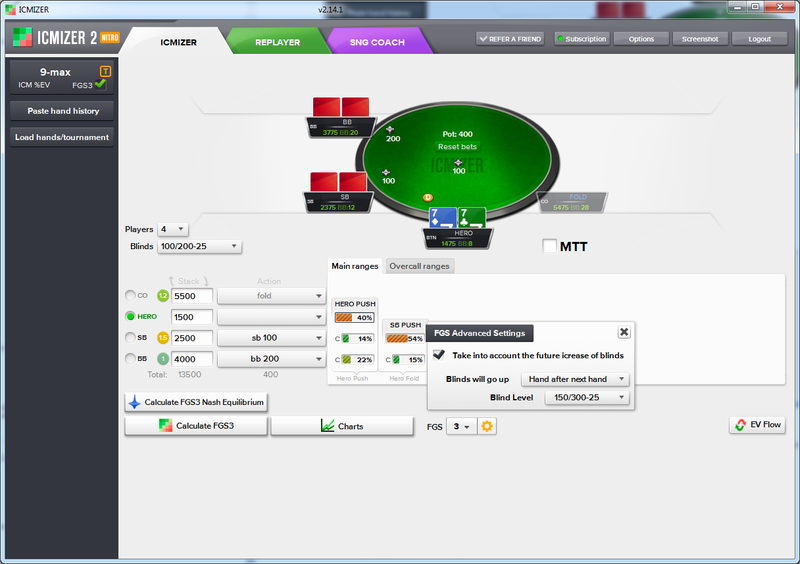 So in this tournament situation winning 4000 chips only adds 10.93% of tournament prize pool to BB player. But losing costs him 29.23% of prize pool, even though the chips that he wins or loses are the same. If you click only any bubble factor you will see the detailed bubble factor table which shows bubble factors of each player against each other player. As we see, the bubble factor for BB versus UTG is indeed 2.67 so our math was correct. Okay, interesting but how can we use Bubble Factors? Great question! We can take the bubble factor and quickly estimate how much equity we need to call an all-in against a specific opponent. With bubble factor 1 we can say for simplicity that we will need 50% equity versus their range. So with 2.67 bubble factor we can estimate Equity as 2.67 / (2.67 + 1) = 0.7275 or 73%. We hit Calculate and see that our calling range is 99+. With 99 being the worst calling hand let's check the details for this calculation, namely how much equity 99 have versus CO's huge pushing range. As we can see, it is pretty close to 72% which we've calculated earlier. In fact, it is just slightly less because we weren't taking SB and antes into account with our bubble factor analysis. 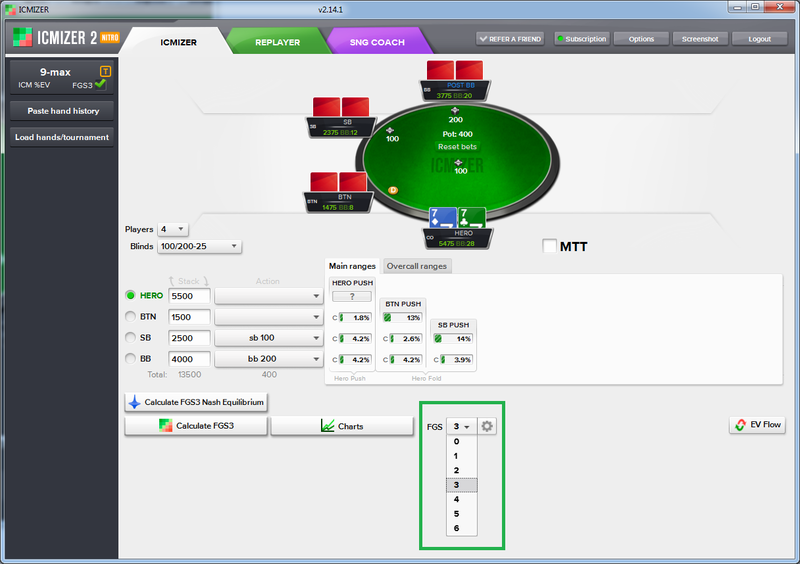 Since the FGS model becomes predominant among professional tournament players, just like ICM did just a few years ago, we've updated ICMIZER interface to make controlling the FGS settings much easier. If you think you have an advanced understanding of FGS you can choose your own settings, but these are my personal recommendations for beginner players. The new feature hides behind the Gear button, which allows you to specify when in the future will the blinds go up. This is particulary important in certain tournaments which feature a steep increase of blind levels, like 6-max Satellite Tournaments on PokerStars. The header pretty much has it, now you can see the PKO bounties on players. 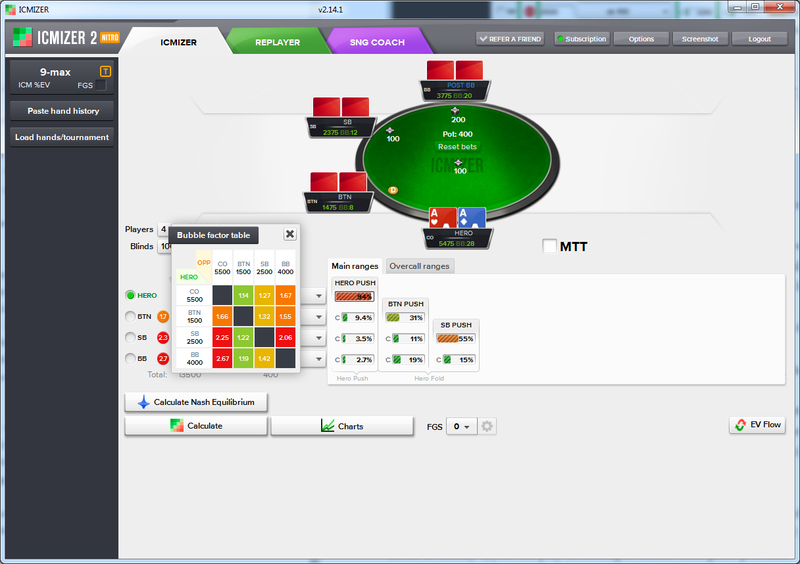 This will help you with reviewing your PKO tournament sessions. These will decrease the annoying mouse clicking and will make the review process even smoother. This feature was disabled in last years update 2.10 and we've finally brought it back by popular demand. Note that like in 2.9 or before, calculation of Nash Equilibrium ranges is not allowed in this type of situations. 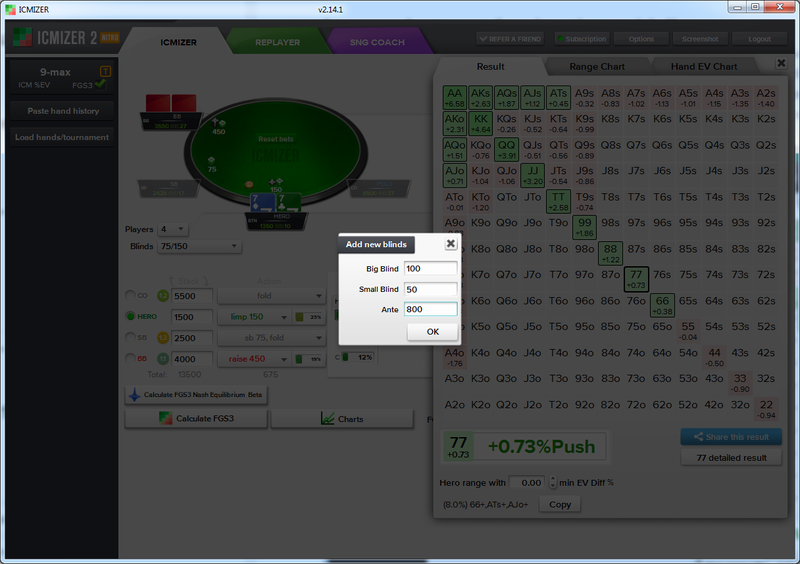 But you can manually edit all ranges (which are usually pretty far from Nash anyway) and calculate the correct play. While limps are rarely a large part of optimal strategy of professional players, they happen a lot in all types of tournaments. Because of this we were getting a lot of requests to improve support of situations with limps. In 2.13 update we've made huge steps in this direction—you can now calculate Nash ranges in situations with limps and review situations which previously were marked as invalid, like where you limp, and opponent raises with a less than all-in bet. 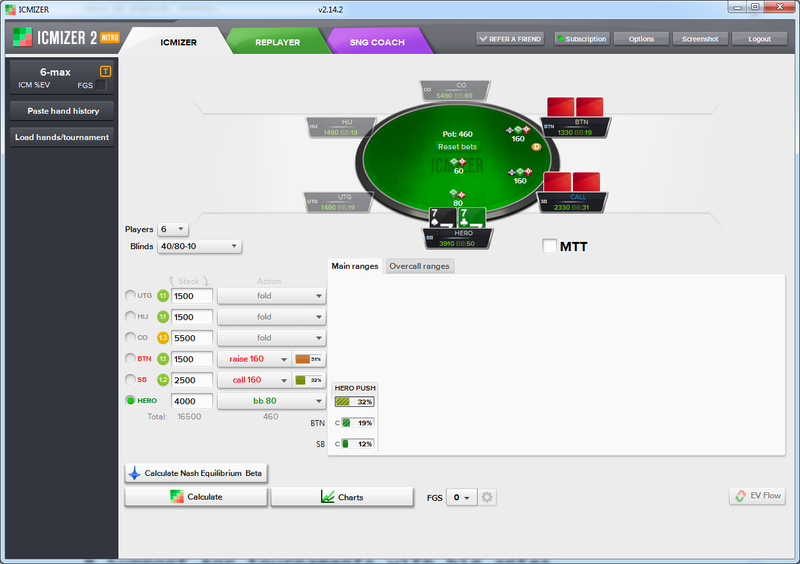 Situations with limps are now also fully supported in KO and PKO tournaments. As part of change of handling situations with limps we've also has changed how ICMIZER handles situations with another type of potential split pot—when there is a raise and a flat call (see the screenshot). 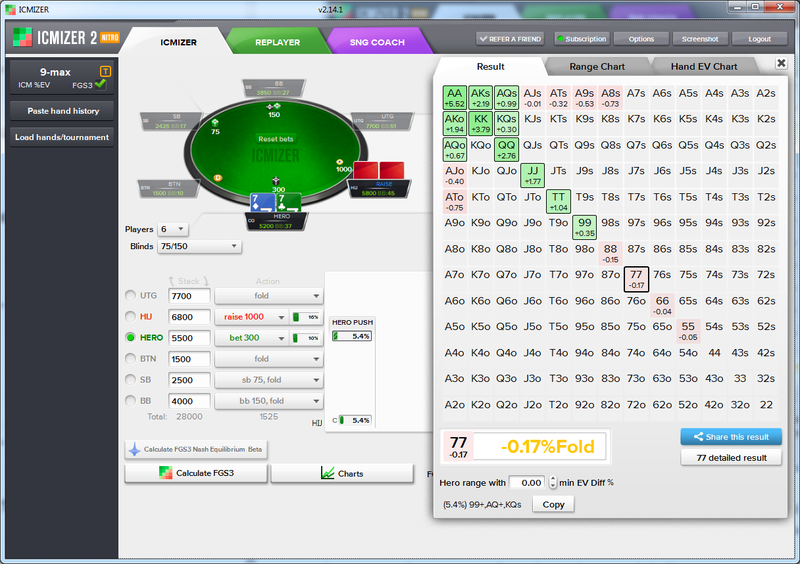 We've changed the calculation method for splitting the pot. Before it was simply split evenly among the contesters. Now the pot is divided between them according to their range strength, which is a better approximation of what could happen postflop. This means that if you review situations like the one above, which you have reviewed before this update, now you will get a different and more precise results. As these types of tournaments become more popular we started to get requests to allow creating blinds with huge antes, much larger than big blind. The tournaments with blinds like these are popular in some Chinese rooms and sometimes take place even in the bigger rooms. This limitation existed since the launch of ICMIZER 1 in 2011 and it is finally no longer here, you can now create custom blind structures with big antes! That's the short description of most major new changes & new features which were brought in ICMIZER updates 2.13 & 2.14. 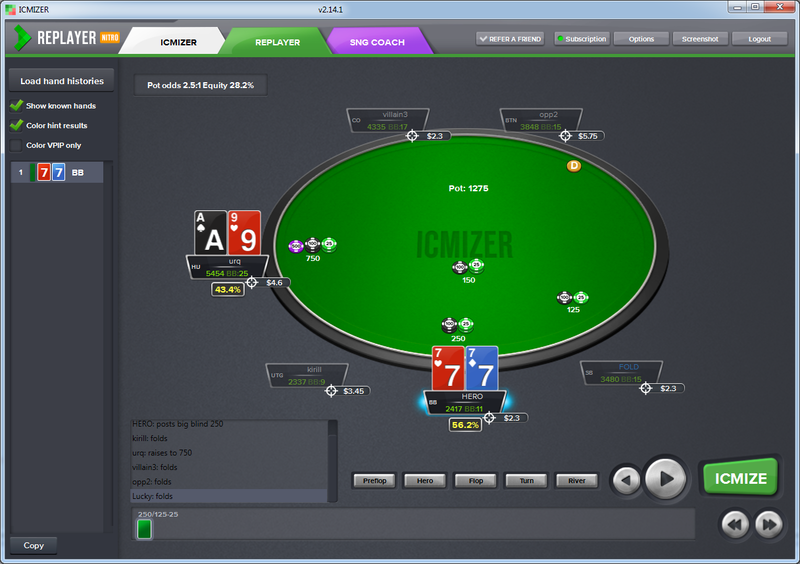 In the meantime, we are going full speed with the development of ICMIZER 3. We are also pretty excited to hear what you think about the new features which we've recently added and described in this article. The release date is classic "when it is done". It's as specific as possible at this point. We want it to be great and not like many game releases which often go south when teams rush them to a specific date and have to compromise on the quality.